When Channel 4 first started airing in 1982 children’s programmes were fairly thin on the ground on the channel. They may even have been non existent because if I remember correctly it initially didn’t start broadcasting each day until late afternoon. When kids programmes on Four did make an emergence though, they were often aimed at younger children and were actually very good. 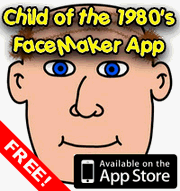 A good example of this is Pob’s Programme, which first came on air in 1985. It was created by Doug Wilcox and Anne Wood of production company Ragdoll. If that sounds familiar then Anne and Ragdoll have gone on to be incredibly successful with shows such as Teletubbies and In The Night Garden. 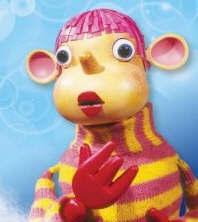 Back to our friend Pob then. Pob was a puppet with a large round (presumably wooden) head with big sticky out ears and pinky purple papery looking hair. You never saw his body because he wore a very long pink and yellow striped knitted jumper, the end of which stretched far away below him, and was slowly unravelling as if someone was pulling at a loose end. Pob was supposed to live inside your television set, so our view was generally of Pob stood in front of the electron guns behind the glass of the screen. Pob would use the screen to write his name and draw pictures, which he did by breathing on the screen (it sounded more like blowing raspberries though) until it fogged up and he could draw on it with his finger. Pob had a strange way of speaking, which was mostly English but with a lot of unnecessary repetition and the odd bit of incomprehensible mumbling to himself when it seemed like he was getting frustrated by something. I mentioned his jumper unravelling earlier, and the reason for this was the episodes special guest. Many household names appeared on the show, including Brian Blessed, Spike Milligan and Roy Castle among many others. The guest would arrive in a garden, and follow a length of wool to try and find Pob. Along the way the guest would play games and read stories, and at the end of the show would leave Pob with a little present to play with, whilst the end credits ran, which Pob wiped off the screen with a duster. One interesting aspect regarding the guests was that the guest for the next episode used to arrive at the end of the show, then realise they were a week early and wander off feeling sheepish. Pob’s Programme is a very fondly remembered show with anybody who saw it, and if you count yourself in that group then you might be excited to find out that the voice of Pob, Robin Stevens, has actually posted a whole bunch of Pob videos on YouTube, which are definitely worth a look if you’re a fan. This entry is filed under TV - Kids	and was posted on March 10th, 2010. You can follow any responses to this entry through the RSS 2.0 feed. You can leave a response, or trackback from your own site. I wanted to run this by you because I figured this would be something you would like to hear. permission from Ragdoll productions and Ch4 to produce an online channel for Pob. on recreating Pob but he is a long way from building the website and set for the show.